An unfortunate side effect of my current circumstance is that I now have to have regular blood draws to keep track of whatever it is my body is up to. 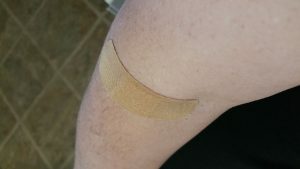 I’ve never been a fan of needles, so this is a cause of no little distress, and I find I’m even more distressed by the fact I’m getting used to being stuck on a regular basis. I’ve also developed something of a grading system for the quality of the stickers. Part of my aversion to needles is that I have always been a hard stick with soft, rolly veins that often collapse when penetrated by a needle. Finding someone who can get me on the first try is a rare commodity, and I do my best to remember who they are and what they did for future reference. Today’s sticker was a keeper and used a few tricks I’ve never seen before like using an upside-down blood pressure cuff instead of a tourniquet to help things along. If I’m going to have to do this on some kind of a regular basis, tricks like that are worth remembering.